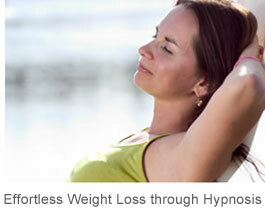 Try Weight Loss through Hypnosis Visualization and Forget Willpower! Are you wondering how effective a program of weight loss through hypnosis is? Or, how many pounds can you lose safely through hypnosis and how fast? And are you concerned that hypnosis might make you do something you don’t want to do? Let’s start by addressing this last question first. Then, after getting answers to your questions, you can listen to (or download) a self hypnosis with relaxing guided visualization for weight loss. So first, you should know that hypnosis can never make you do anything you don’t want to. Hypnosis allows your mind to accept new ideas – but only as long as these new ideas are not in conflict with your personal values. You should also know that self hypnosis for weight loss works best when you use the right hypnosis instructions for your own personality type. So hypnosis helps you reach your goals of breaking bad habits and adopting new, healthier ones, but they must be YOUR goals. You are in charge all the time, because your goals are conscious thoughts – as opposed to behaviors, which are automatically learned and kept in place at a subconscious level. In other words, hypnosis helps you get out of your own way through a natural process of behavior self-modification. In common, everyday language, the hypnotic trance is nothing more than a state of very relaxed consciousness. …because under hypnosis you get into a very relaxed state, during which empowering verbal suggestions for change bypass your conscious mind reaching easily your subconscious. Once registered here, these suggestions install the necessary supportive behaviors and then your conscious mind and body adopt them without any effort. With new behaviors, similar with the ones of a thin person, you start to drop weight naturally, without any resistance or struggle. Of course, you won’t lose the extra weight that took months or years to accumulate in just a few days or a couple of weeks. But with healthy behaviors, you’ll drop the pounds faster, safer and easier than ever before. Plus, you’ll keep the weight off for good. Very simplified, all these techniques are profoundly relaxing and empowering at the same time. They all work by putting you first into a state of deep and complete relaxation and then guiding you to visualize yourself at your ideal weight, toned, full of energy and doing what the thinner YOU would normally do. So, now that you know how losing weight through hypnosis (or guided visualization) works, you may want to experience it for yourself. You’ll soon notice how listening to guided visualizations makes your body and mind fully relax, how it helps you install slimming behaviors and release food cravings. You’ll love the sample audio – it will even improve your sleep making you wake up fully rested, refreshed and energized. A last thing… the more you listen to these guided visualizations the faster your slimming results. In fact, that’s the great thing about hypnosis… you don’t need to exercise any willpower – healthy choices and habits come naturally to you!